Armies in the 1990s are commonly involved in low-level, ill-defined, politically charged, messy situations known collectively as "unconventional warfare". Thomas Adams argues for a shift in expectations with a greater willingness to accept lengthy commitments and incremental progress. 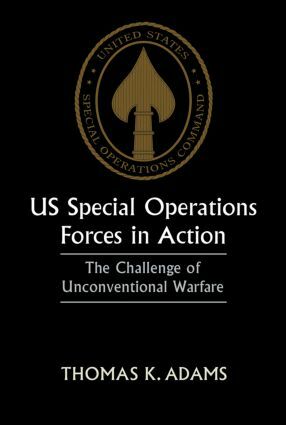 "Whether the big SOF battalions of the United States are right for such delicate tasks is just one of the questions put forward in this interesting book, which deserves a wide readership among the political and intelligence communities, as well as in the military world." "A revealing, entertaining, hard-headed look at Special Operations"
"This is probably the best book of its type available to the general public". "Adams sets out to examine the more important issues of whether today"s Army Special Operations Forces are really "special" or whether they perform unusual or unconventional missions at a much higher level of proficency than others in the Army,"
"…an important book, an interesting book, a "good read" and an exasperating book… Deserves a place of honour on the bookshelf of all who would know what special operations are about. More important, it deserves to be read." "This is a book that does several things well … The author"s operational experience, scholarly approach, and intellectual honesty combine to provide an excellent beginning point from which to reinitiate the process of rethinking the problem of military force size, structure, and purpose(s).